An analysis produced by Designing Libraries highlights 135 new or refurbished library buildings opened or committed to since 2011. The number rises to around 185 when taking into account the announced longer term plans for library investment by Hillingdon, Lancashire and Nottinghamshire councils. Designing Libraries Executive Director, David Lindley, says: “While no one is any doubt that councils are facing tough choices as a result of cuts to budgets, it is equally clear that many are responding creatively to the challenge, rethinking the role of libraries in their communities, radically restructuring their buildings portfolio but also investing in new facilities. 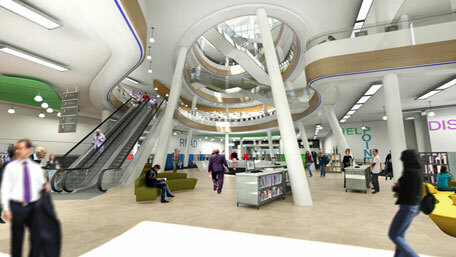 Among the libraries included in the survey, which covers libraries in England from 2011, are ‘beacon’ libraries such as the new Library of Birmingham, scheduled to open in September; The Hive in Worcester, the first joint public and university library in the UK; the architecturally impressive Canada Water library in Southwark and the new Clapham library, and the major city library refurbishments of Manchester and Liverpool central libraries.